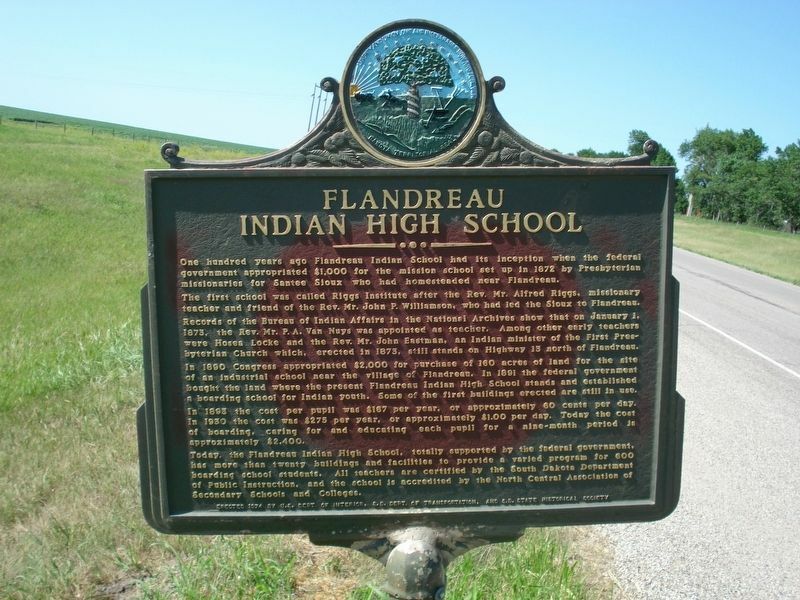 One hundred years ago Flandreau Indian School had its inception when the federal government appropriated $1,000 for the mission school set up in 1872 by Presbyterian missionaries for Santee Sioux who had homesteaded near Flandreau. The first school was called Riggs Institute after the Rev. Alfred Riggs, missionary teacher and friend of the Rev. Mr. John Williamson, who had led the Sioux to Flandreau. Records of the Bureau of Indian Affairs in the National Archives show that on January 1, 1873, the Rev. Mr. P. A. Van Nuys was appointed as teacher. Among other early teachers were Hosea Locke and the Rev. Mr. John Eastman, an Indian minister of the First Presbyterian Church which, erected in 1873, still stands on Highway 13 north of Flandreau. 60 cents per day. In 1930 the cost was $275 per year, or approximately $1.00 per day. Today the cost of boarding, caring for and educating each pupil for a nine-month period is approximately $2,400. Erected 1974 by U. S.Department of the Interior, S. D. Department of Transportation, S.D. State Historical Society. Location. 44° 3.854′ N, 96° 35.256′ W. Marker is in Flandreau, South Dakota, in Moody County. 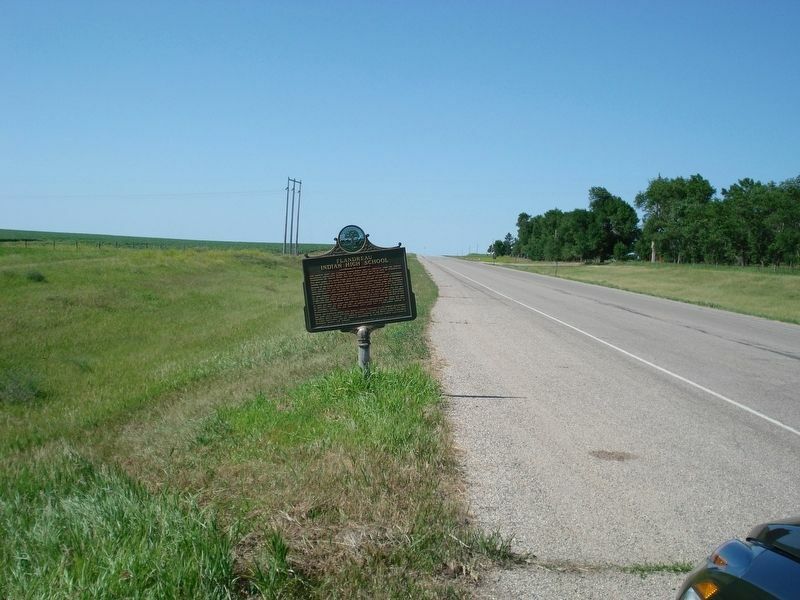 Marker is on State Highway 13 0.2 miles south of 229th Street, on the right when traveling south. Touch for map. Marker is in this post office area: Flandreau SD 57028, United States of America. Touch for directions. (approx. 14.2 miles away); First Convention in Brookings County (approx. 14.2 miles away); Medary Townsite (approx. 14.2 miles away). More. 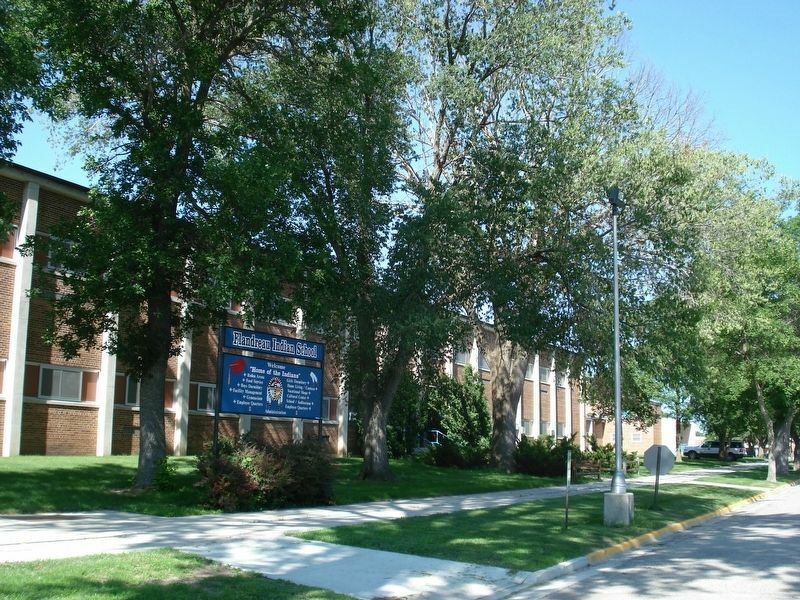 Search the internet for Flandreau Indian High School. Credits. This page was last revised on March 10, 2019. This page originally submitted on March 10, 2019, by Roger Dean Meyer of Yankton, South Dakota. This page has been viewed 45 times since then. Photos: 1, 2, 3. submitted on March 10, 2019, by Roger Dean Meyer of Yankton, South Dakota.